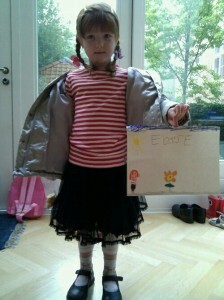 Eloïse did a self-portrait this morning before school. She gave it to her teacher but I had to take a photo first because we were both impressed with how the little figure matched her outfit today. Ian didn’t want her to give it away! Precious! Frame it! you will not regret it. 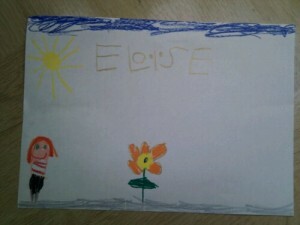 I love the flower AND sunshine in her world…where has she seen sunshine?? Ha Ha. 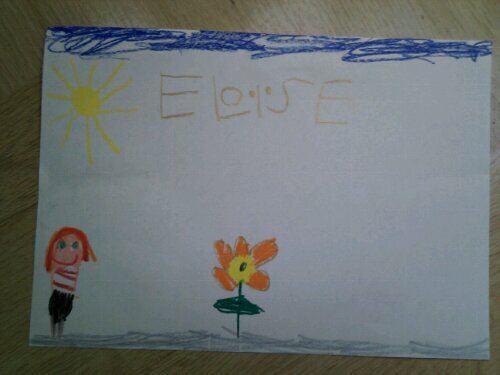 I wish I could frame it, but alas it went to her teacher. I wonder what she does with all the pictures that the kids bring her. Maybe we’ll get it back at the end of her time in that classroom, who knows. you should have scanned it. lovely!